My goal and standard will be to finish each and every week with a total score of +2 or higher. After calculating this week's total points, I finished with a score of +6 (10 positives, 4 negatives, 1 neutral). To think of it another way, I was correct on about 70% of my predictions. I consider this to be a very good success rate. When looking within each position, it's easy to see that I had a very high success rate with LB's and DB's. However, the success rate for DL wasn't what I expected (once again this week). Moving forward to next week, I will put more of my research time into the DL position (which is statistically the hardest position to predict success for). 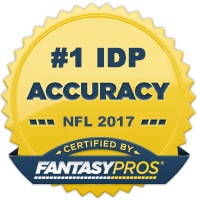 Thanks for reading and be on the lookout for my "Week 12 IDP Waiver Wire Pickups" article shortly.